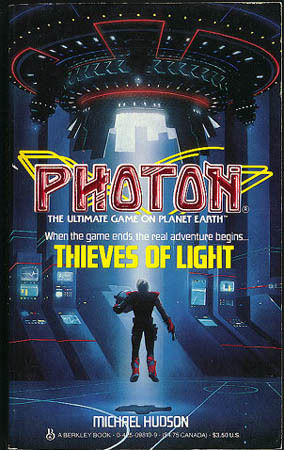 Looking Back: In the 1980s, Photon was one of two popular arena games using light guns and sensors in an SF-flavored variation on Capture the Flag. Taking a page from The Last Starfighter, the creators of Photon attempted to launch a syndicated television series about the adventures of Bhodi Li, a human teenager recruited by means of the game to fight in an interstellar war. Two different book tie-ins–an “adventure novel” series for young readers and a young adult series–were launched at the same time. Peter David (writing as “David Peters”) was hired to pen the adventure novels, which ran to six titles before being cancelled. I was hired by Berkley to write the lead title for the young adult series (though while it was being written, it was repositioned as a normal SF release). Thieves of Light (my title) was ostensibly to be a novelization of the pilot for the television series, which was produced by DIC Animation City. When the bible and script reached me, I was aghast–the script was juvenile in the worst sense, and Bhodi Li’s fighting companions included a giant lizard and a talking duck. Taking some liberties with the source material, I managed to turn in a military-SF coming-of-age story which I would not be embarrassed to have appear (or reappear) under my own name, and to do it in under sixty days. I still consider both parts of that achievement a small miracle. The pen name, however, was part of the plan from the beginning–I was only in for one Photon novel no matter how well they did, and editor Susan Allison wanted a house name that could be used for the whole series. I contributed the “Michael” and she contributed the “Hudson” (from her address at the time, I believe). The Photon television series was cancelled during its first season (I had been told after just one episode was broadcast, though I’ve seen a list of eighteen episodes). I have never seen any of them; the show was not carried by any stations or cable networks available in my area.